With its shocks, thrills and intense atmosphere, Alien was one of the first films to effectively merge the two genres of Sci-Fi and Horror. This was also one of the first films to feature a woman in a lead action-hero role, namely Sigourney Weaver. Alien along with Blade Runner cemented Ridley Scott as one of the greatest directors of all time. Scott slowly raises the sense of menace and tension in the film until the level of suspense during the final 30 minutes is almost unbearable. The production design by Michael Seymour and the alien creature design by H.R. Giger is some of the best science fiction detail ever seen in film. 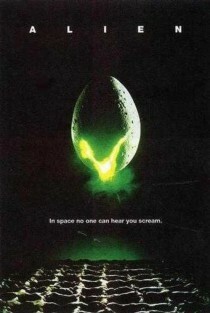 This film has been extremely influential, becoming a blueprint for an entire sub-genre, namely Sci-Fi Horror. Yet three decades on, it remains the freshest looking and scariest. This movie definitely deserve to be listed here, in this great blog! I’m looking forward to “Prometheus” the newest master piece of Ridley Scott. fantastic movie! must have 4 every sf fan! keep up the good work. didn’t see that you reviewed this one, missed it, lol. I love this film to no END. cannot wait for Prometheus. I agree about the production design too. good catch on that. it is amazing to behold.